A Kenilworth woman has battled through life-threatening injuries after a head-on car crash to walk again. Hollie Smith, 24, broke a staggering 27 bones in the crash which happened in November last year. Among her injuries were a broken neck and back, crushed legs and a fractured skull. She was trapped in her car for an hour and 20 minutes following the crash on the B4100 between Burton Dassett and Gaydon before fire crews cut her free and she was rushed to hospital. She was close to death after suffering extreme levels of blood loss, but after being given five pints of blood in hospital she was able to survive. Hollie spent months in hospital, the first six weeks of it flat on her back and able to move only her arms. Once she was able to move she began her painful battle to be able to walk again. Although she still has to spend most of her time in a wheelchair, she has managed to walk a short distance with the aid of a frame. 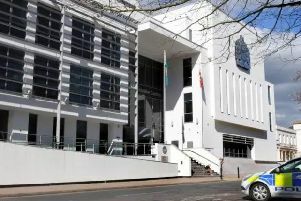 And she was in the public gallery of Warwick Crown Court to see the other driver, Mark Barnes, plead not guilty to causing her serious injury by dangerous driving. The court heard that Barnes, 49, of Hill Close, Southam, has put forward a defence that he suffered some kind of seizure, which was rejected by prosecutor Rebecca Wade. She pointed out that was similar to a defence of insanity, in that it would require two medical reports to establish it as a defence to the charge. The case was adjourned for trial on Monday July 17, 2017, 20 months after the life-changing collision, and Barnes was granted bail.